14. Then Deity said to Moses, “ehyeh asher ehyeh”. And he said, “Thus you will say to Israel’s Sons: ‘ehyeh has sent me to you’. Although there has been much debate over the meaning of the question of Exodus 3:13, it makes perfect sense to me. To begin with, Moses was quite understandably anticipating what the Israelites would say to him when he told them that their God had sent him to them. The first thing he anticipated them asking for was the name of their God, YHWH, which if Moses had not known would have proved he was not sent by Him. It would, therefore, have been a perfectly reasonable and practical question for the Israelites to ask. As for Moses’ question of Exodus 3:13, “What should I say to them?”, we need only keep in mind one certainty to understand what Moses was asking for in these words. That certainty is that Moses already knew of the existence of a Divine name in Israelite tradition when he asked this question of God. We know this for certain because Moses refers to a Divine name in Israelite tradition immediately before he asks the question of God. It is very unlikely that he could have been aware of the existence of a Divine name without being aware of what it was and so I believe we can say with certainty that Moses knew the name YHWH before he asked his question of Exodus 3:13. Moreover, we are informed that as a young man Moses regarded the Hebrews in his midst as his kinsfolk (Exodus 2:11). It is very unlikely that he would not have known the most important feature of his kinsfolk’s religion – the proper name of their God – and so our certainty is confirmed that Moses knew the name YHWH before asking the question of Exodus 3:13. Furthermore, his father-in-law in Midian was a priest (Exodus 2:16) and as such would surely have known the names of the most prominent regional deities, amongst which YHWH would have been counted, which also confirms our certainty that Moses would have known the name YHWH before he asked the question of Exodus 3:13. Bearing in mind these three points, the question of Exodus 3:13 can perhaps best be understood as Moses saying to God, “I know that You have a proper name, and I even know what that name is, but I still want direction from You as to how I should respond to the Israelites if they ask me for Your name”. In response to his question Moses received what was no doubt more than he had expected when he asked the question of God, just as the Israelites received more than they could have expected when they asked Moses for the name of their God. Neither Moses nor the Israelites could have expected to receive two names in response to their respective questions, but that is what they did receive. For his part Moses received two answers to his question of Exodus 3:13, or two parts of the one answer, one of them in Exodus 3:14 and one in Exodus 3:15. He was told that when the Israelites ask him for the name of the God who sent him to them, he was first to say that ehyeh had sent him to them (3:14b) and he was then to say that YHWH had sent him to them (3:15). Both words are clearly intended to be understood as answers to the same question because the sentence structure in the two verses is identical, they have a shared vocabulary and there is only one question being answered. Irrespective of the widespread opinion that these verses are attributable to the Elhoistic source, the entire passage is written with great care and deliberation and is clearly intended to be read and understood precisely as we find it. Considered in this way, and as the bold-type text makes clear, the most important difference between the two answers Moses receives to his question is that in the position where Exodus 3:14b has the word ehyeh, Exodus 3:15 has the name YHWH. Both are identified as sending Moses to the Israelites, and because there is only one God doing the sending, both must be names of the God of Israel. Moreover, the word ehyeh is a first person singular of the verb, which means that as a name it can only be one by which God knows Himself; a Personal name. Therefore Ehyeh must be the Personal name of God and YHWH His proper name. It will be recalled that this conclusion is supported by the interpretations of Recanati, Rashbam, Ibn Ezra, Sarna and Buber among others. Next we must endeavour to translate the name Ehyeh of Exodus 3:14b from a study of the Biblical text, and to do this I will first consider the theological dimensions of the verse in its context and then I will consider the linguistic questions that attend upon it. I will turn my attention to the words of Exodus 3:14a later in Part II of this paper. In a footnote to Exodus 3:14b in the 1985 JPS Tanakh, the two possible literal translations of ehyeh are identified. These are, by universal scholarly consent, “I am” and “I will be”. Translating the ehyeh of 3:14b as ‘I am’ does present considerable interpretational difficulty but so too does translating it as ‘I will be’. The crucial difference between the two is that whereas the words ‘I am’ standing alone can be reasonably understood to be God’s self-designation, the absolute declaration ‘I will be’ cannot. This is because in Judaism God is understood to be eternally immutable and so He is understood to be in the present as He always was in the past and as He always will be in the future. If God were to designate Himself in absolute terms that refer to the future (‘I will be’), that would imply that He is not yet God, or that He is God but is in a state of becoming somehow other than He now is, both of which are absurd and unacceptable to the Mosaic monotheist (i.e. one who adheres to the Monotheism of Moses, most notably Jews). For a second opinion on this point see De Vaux, who is cited in the linguistic analysis later in this page where he is quoted as saying the following: “It seems difficult to allow that, in Ex. 3.14(b), ehyeh should be translated by a future. In all the parallel texts which have been cited (i.e. Exodus 3:13, 4:12, 4:15), ‘I shall be’ is determined by an addition. One can say: ‘I shall be this or that, I shall be with… like…for…’, but one cannot say absolutely ‘I shall be’ in the first person, as this would suggest that the speaker does not yet exist”. When articulated by God, the absolute statement ‘I will be’ must be determined by an addition in order to render it theologically meaningful, such as the oft-suggested ‘I will be with you’. However, this addition could very easily have been rendered in the original Hebrew if that was the meaning intended, and an example of precisely this is to be found in Exodus 3:12 where God assures Moses of His presence with Him and does so clearly if not entirely unambiguously. However, whether in Exodus 3:12 the ehyeh is translated as ‘I will be’ or ‘I am’, the meaning of the declaration is clear and essentially the same. So why would God repeat this assurance two verses later in response to an entirely different question and in the most baffling words in the Bible? That does not make any sense and so it cannot be true. Moreover, it is very hard to imagine why God would have been anything less than clear in His communication to Moses at such an important moment in the history of Israel. I therefore consider ‘I will be’, with any addition, to be an unacceptable translation of the name Ehyeh of Exodus 3:14b, whatever interpretational difficulty attends upon the only other candidate translation, ‘I am’. Therefore this analysis clearly indicates that the translation of the name Ehyeh in Exodus 3:14b is ‘I am’. However, not everyone will accept this while there are outstanding linguistic considerations to be addressed, and so let us move on to linguistics. The linguistic analysis of Exodus 3:14 is moderately complex for the non-linguist, but there are in the final analysis only three linguistic facts that the reader need bear in mind. The first is that the only literal translations of the Hebrew ehyeh of Exodus 3:14 are “I am” and “I will be”, upon which point there is no debate. The second is that although it has been claimed that the present tense of the verb ‘to be’ is never expressed by the imperfect of the verb root hayah (e.g. ehyeh), this is simply false. The third is that although some have suggested that the verb root hayah does not connote the meaning of ‘to be’ in the sense of ‘to exist’, this too is false. The first of these three points is commonly acknowledged and so requires no further attention. The latter two, however, do require some attention. Starting with the second of the three points – i.e. the tense conveyed by the imperfect of the verb hayah – I will begin by quoting what Propp has to say on this subject in Exodus 1-18 (p.204). This is very easily done because Propp has remarkably little to say on this very important subject, stating in a single short sentence only that: “The imperfect of hyh always refers to the future”. The only support he presents for this contention are two citations; one of them a paper written by Raymond Abba in 1961 entitled “The Divine Name Yahweh” and the other an essay written by Roland de Vaux in 1970 entitled “The Revelation of the Divine name YHWH”. Because these two authors are Propp’s chosen authorities in support of his contention, and as such are presumably considered by him to be sufficiently authoritative for that purpose, I will analyse only what these two have to say on the subject in order to demonstrate his error. Dealing first with Abba, his statement on the subject reads as follows (bold type my own): “Others, taking the impf. Qal in the sense of a present tense, translate ehyeh as “I am” and Yahweh as “He is” – i.e. “the Self-existent one”. Against this view two objections may be raised. First, in biblical Hebrew the present tense of this verb is never expressed by the imperfect but always by the perfect tense; the imperfect expresses the future. And second the verb hayah never means pure existence; rather it has the sense of “happening”, “becoming”, “being in a certain place or state”, “being present””. Just concentrating on the bold type for now, I suggest that you consult your Bible and consider the following comprehensive list of biblical verses in which the first person singular Qal perfect of hayah expresses the present tense meaning “I am”. They are Job 19:15, Psalms 31:13, Jeremiah 31:9, Lamentations 1:11, Micah 7:1 and perhaps Job 11:4. Now consider the following comprehensive list of biblical verses in which the first person singular Qal imperfect of hayah (i.e. ehyeh) expresses the present tense meaning “I am”. They are Ruth 2:13, Job 7:20; 12:4; 17:6 and of course Exodus 3:14. You will notice that the present tense meaning of “I am” is expressed almost equally in biblical Hebrew by the perfect and the imperfect of hayah and so Abba’s statement to the contrary, in bold type above, is false. Hence Propp’s contention that “The imperfect of hyh always refers to the future” is likewise false. Moving on to De Vaux’s contribution to this debate, it reads as follows: “The imperfect of hayah as a stative verb, ‘to be’, always has a future sense”, and he supports this contention with reference to the translation of ehyeh in Exodus 3:12, 4:12 and 4:15. However, his comments on Exodus 3:14b just a few lines later are strikingly at odds with this contention, reading: “It seems difficult to allow that, in Exodus 3:14(b) ehyeh should be translated by a future. In all the parallel texts which have been cited (i.e. Exodus 3:13, 4:12, 4:15), ‘I shall be’ is determined by an addition. One can say: ‘I shall be this or that, I shall be with…like…for…’, but one cannot say absolutely ‘I shall be’ in the first person, as this would suggest that the speaker does not yet exist…. It would seem that this future is only an apparent one”. So on the one hand De Vaux insists that the imperfect of hayah always has a future sense, which we have already established to be false, while on the other hand he acknowledges that the absolute ehyeh of 3:14b cannot be a future tense because to translate it as such is theological nonsense. However, he is determined to have the ehyeh of Exodus 3:14 translated as a future tense no matter what absurdity he must propose in order to have it that way, and so he proposes an “apparent” future tense. And what is an “apparent” future tense? It is nonsense, plain and simple. Moreover, in relation to the verses De Vaux cites in support of his contention, I would make the following observation. 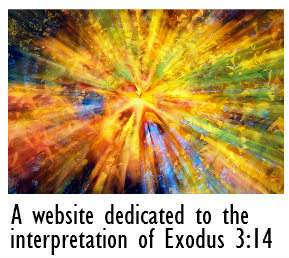 Although the ehyeh of Exodus 3:12 is commonly translated as ‘I will be’, this is a translational choice and is therefore based upon how the text is read and understood. I would suggest that the ehyeh of this verse would be more meaningfully translated as ‘I am’ when we bear in mind that the context of Exodus 3:12 is that of God assuring Moses of His presence with him, and so in this verse the preferred and correct translation of ehyeh is at least debatable. Moving on to the third of the three points identified above – i.e. that the verb hayah conveys the meaning of ‘to exist’ – I will begin by noting Abba’s contention to the contrary in the extract of his paper quoted above, which reads as follows: “the verb hayah never means pure existence; rather it has the sense of “happening”, “becoming”, “being in a certain place or state”, “being present””. He doesn’t suggest any alternative word or phrase that might be used to convey the meaning of ‘to exist’, but Rosenzweig did and Propp appears to have followed Rosenzweig’s lead. Before I consider their alternative suggestion I will settle the immediate question under consideration. To this end, there is very good evidence from first to second century Jewish religious writings that the ehyeh of Exodus 3:14 was commonly understood to convey the meaning of ‘to be’ in the sense of ‘to exist’. That evidence is to be found in Targums Neofiti and Pseudo-Jonathan, for which see Jewish Bible Translations above. There is also the witness of the Septuagint translation of the verse in which ehyeh is clearly understood as ‘to be’ in the sense of ‘to exist’, for which see Early Jewish and Christian Translations above. Then there are the interpretations of Maimonides, Sforno, Halevi and Recanati among many others, all of whom understood ehyeh to connote the meaning of ‘to be’ in the sense of ‘to exist’, for which see Medieval Jewish Thought and Kabbalah above. And finally there is no other word or phrase in biblical Hebrew that does convey the meaning of ‘to exist’, and so if this meaning were to be literally and unequivocally conveyed in biblical Hebrew then there would be no alternative but to employ the obviously suitable hayah. I believe, therefore, that we can say with complete certainty that the verb root hayah does convey the meaning of ‘to be’ in the sense of ‘to exist’ and that Abba’s contention to the contrary is false. As for Rosenzweig and Propp’s alternative suggestion referred to above, they are by their own admission guessing when they suggest that if the meaning of personal existence were to be conveyed in biblical Hebrew then it would be somehow rendered using the personal pronouns ani/anoki (meaning ‘I’) and ‘hu’ (meaning ‘he’). Such conjecture has no doubt been prompted by the manner in which the ‘ani hu‘ declarations of Second Isaiah are translated into Greek in the Septuagint. However, ‘ani hu‘ is a non-verbal clause that translates literally as “I he” and may or may not be rendered in translation as “I (am) he”. It does not translate literally as ‘I am’ because the verb ‘to be’ does not feature therein and the third person masculine personal pronoun ‘hu‘ does. Furthermore, there is no example in the Bible of a declaration that exclusively employs a combination of the first person pronoun ‘ani’ (or ‘anoki’) and the third person pronoun ‘hu’ to unequivocally convey the meaning of ‘I am’ or ‘I will be’. Hence their alternative suggestion falls. From the above linguistic analysis we may say that there is no linguistic objection to either of the two possible translations of the name Ehyeh, but there is also no indication of which of them it is. By contrast, the theological and contextual considerations that I have written of above inform us with some confidence that the translation of the name Ehyeh is ‘I am’, which now at least has linguistic license. So we have made some progress in our enquiry. However, we have yet to translate the twofold ehyeh of Exodus 3:14a, but this must be left until later in Part II of this paper. What next needs doing is to establish the meaning of the name Ehyeh. To this end we are informed in Exodus 4:31 that the new name Ehyeh was enthusiastically received by the Israelites, which means they must have understood its meaning, which means that Moses must have explained it to them. We must assume that Moses came to understand the meaning of the name either immediately upon learning of it or a short time thereafter but certainly before he arrived in Egypt. He would surely not even have set out for Egypt without such an understanding because he knew that he would need to explain the meaning of the previously unknown name and establish its relationship with the name YHWH before the Israelites would accept its legitimacy. But they did accept it, which informs us that Moses must have done this successfully and that he must have fully understood the meaning of the name Ehyeh to be able to persuasively communicate that meaning to a no-doubt sceptical audience. Without such an understanding of the meaning of the name, the revelation of the name would have been pointless. However, we have no record of Moses’ explanation of the meaning of the name Ehyeh and so we must discover that by other means. The remainder of this paper is an explanation of the meaning of Exodus 3:14, first the name in Exodus 3:14b and then the words of Exodus 3:14a.